Capel Dewi is a small village, five miles from Carmarthen, on the B4300 road to Llanarthney, and Llandeilo. The village is a farming community, that has grown into a commuter village, for people working in Carmarthen and the surrounding area. 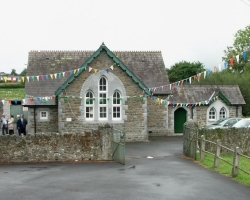 The Old School was bought from Carmarthenshire County Council in 1992 to use as a meeting point for the community. It is used regularly for Computer classes, Line dancing, and the Young Farmers. Once a month the Community has coffee mornings, and committee meetings. A tennis court and childrens play area were added in 2001, with the help of grants. In 2009 a new building was erected as a workshop/store, and is used by the Young Farmers, and for short mat bowling. Hire of the hall, £25 per 3 hours, or £40 for the day. The hall has a kitchen, toilets, and seating for 80 people. It is heated with storage heaters, and supplimentary electric heaters. The Annex will have storage heaters shortly, and has a toilet.